This month’s Ellen Hutson Pin-Sights Challenge inspiration plays tribute to Fall and all its trappings from pumpkins, leaves, Halloween parties, treats and the color orange. My interpretation of the images is a pumpkin patch late on Halloween night. Ghosts float eerily above the pumpkins in the field and a bat flies menacingly overhead. For this haunting scene (pun intended), I used the Essentials by Ellen stamp set, Got Candy and its matching dies. I stamped all the images on white cardstock in Memento Tuxedo Black ink. I knew I was going to color the pumpkins with Copic markers and Memento Ink is Copic-friendly. The pumpkins were colored in three shades of Copics from the YR family and blended. I die cut all the images using the coordinating dies for the stamp set. To create my background, I used black cardstock for my A2-sized card front. I then die cut an arch out of the card front. I used a die from a set of nesting dies by My Favorite things to do this. I used the same die to cut out an arch from deep purple cardstock for my night sky. The purple piece was inserted into the negative area of my card front. I proceeded with assembling all my die-cut images. The ghosts and pumpkins were all glued together, after arranging them the way you see here. I then raised the entire piece with foam tape and the pied was adhered at the bottom of the arch. The bat was mounted with foam tape as well and adhered onto the night sky up to the left. The entire card front was then adhered to an A2 top-folding, portrait-oriented card base. The sentiment is from the same Got Candy stamp set. I die-cut a banner with irregular edges from the same purple cardstock and embossed the sentiment onto it with white embossing powder. The sentiment was mounted on foam tape and adhered just below the arch. The end result isn’t scary at all, but rather cute and fun. Hope you like the card and have a fun, not scary, Halloween. Stamps: Ellen Hutson’s Essentials by Ellen: Got Candy stamp set. Dies: Ellen Hutson’s Essentials by Ellen coordinating dies for Got Candy stamp set; Simon Says Stamp: Sketchy Banners dies set (smaller banner); My Favorite Things Die-namics: Stitched Arch STAX die set (largest die). Ink & Markers: Memento Tuxedo Black dye ink; Versamark Ink; Copic Markers: YR08, YR16, YR18. Other: Hero Arts: White embossing powder. 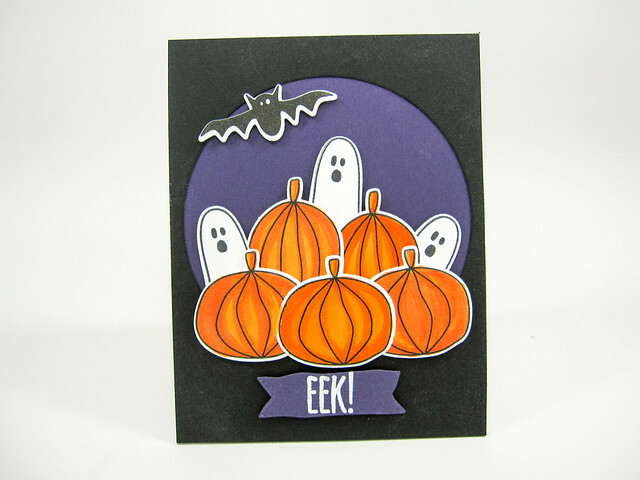 This entry was posted in Challenges, Halloween and tagged Challenge, Ellen Hutson. Bookmark the permalink.